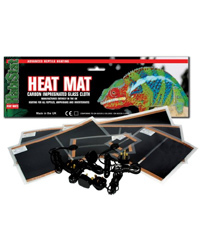 Heat Mats produce ultra long wavelength infra red heat. This wavelength is invisible to the human eye and tends to furnishings in the cage rather than the air. This action of heating is very similar to the sun and it has the ability to heat anything that it strikes but with the air temperature remaining much lower. Reptiles absorb this at in a manner very similar to basking in a natural enviroment. Heat mats do get warm but provide a very gentle warmth which the animal can sit under or on top of. Used under normal conditions the mats cannot burn the animal. It should be noted that heat mats give a gentle background heat. If you are keeping animals that requires higher temperatures, then you may require additional supplemental heating. Many diurnal or day active species of lizard require basking spots of rather high localised heat. Additional heat sources should then be provided for these species. Heat mats are excellent primary heaters for most applications requiring night time heating, as they emit no visable light and are the most widely used heater for this purpose.